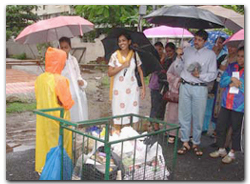 Waste management initiatives at CEE started in 1989 when it, along with other organisations, participated in a forum called the Committee for Clean Bangalore. It prepared a concept paper for cleaning and greening Bangalore city. It was envisaged that each of the organizations which had helped prepare the concept paper, would take up a certain number of issues and work out practical demonstrations that could serve as models for the whole city. Subsequently, CEE took up the issues of solid waste management, conservation of green spaces and promotion of civic responsibility as part of its mandate. CEE has evolved a bottom-up approach to SWM, starting from the sources of generation – households – recognizing that a sizeable part of municipal solid waste (40-70 per cent, varying according to affluence and consumption levels in different localities) is organic and can be composted. By segregating domestic waste at source into degradable and non-degradable, CEE could considerably improve SWM through partnerships between citizens and the Urban Local Bodies. CEE was awarded the UNCHS Global Hundred Award in 1998 for two projects implemented in Bangalore – one on Solid Waste Management, a Community-Based Approach, and another on Innovative Sanitation Facility in low income areas. In 2005, CEE was awarded the ‘Plasticon 2005 Award' by the PlastIndia Foundation in the category of ‘Innovation in Recycling Technology' for its innovation of a ‘polyloom' – a plastic weaving handloom that helps reuse and recycling of discarded plastic bags (polybags). The management of healthcare waste is a subject of considerable concern to public health administrators, infection-control specialists as well as to the general public. This is the waste that is generated during the process of patient care. Over the last few years, proper management of biomedical waste has emerged as a major focus of CEE's activities. Initiatives include, on the one hand, awareness raising, orientation and training programmes, and, on the other, establishment of a common facility for biomedical waste treatment and disposal.